Bats in the United States and Canada are under attack. The culprit? White-nose syndrome, a disease named after a white fungus that latches onto bats' noses and wings. More than 5.7 million bats have succumbed. 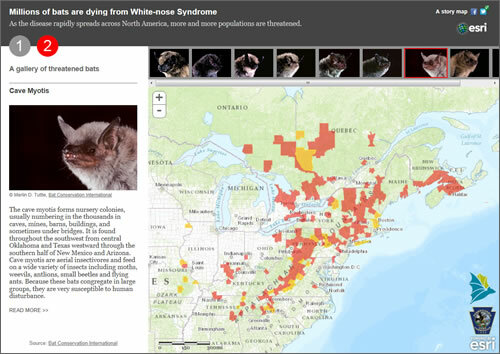 To raise awareness of this devastating disease, the Esri story map team collaborated with Bat Conservation International and others to create an educational story map that illustrates the spread and scope of white-nose syndrome. In this article, Esri's Bern Szukalski explains the steps that were taken to gather the content and create the story map. This Esri story map illustrates the spread of the deadly white-nose syndrome in bats and profiles the threatened species. 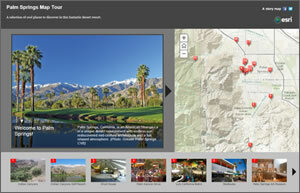 Learn how to make your own Map Tour story map like this one that features Palm Springs using ArcGIS Online and a downloaded version of the Storytelling Map Tour template. Read this tip. In the new frontier of real-time GIS, Esri's ArcGIS GeoEvent Processor for Server ingests data streaming in from sources such as in-vehicle GPS devices and social media platforms, including Twitter. Read this article. Data feeds for your GIS go real time. Maps in your tablets and smartphones go offline. These were just two pieces of important news that came out of the Esri International Developer Summit (DevSummit). Read this article to get the full scoop. Journey down under with Duncan Mallace of the marine survey company MMT as he explains the value ArcGIS for Maritime: Bathymetry brings to exploring the oceans. Watch the video. Plan for evacuations and decide how to protect vital infrastructure using the ArcGIS for Local Government flood planning map. View this video to learn how to use the map. How might London's 1854 cholera outbreak be tracked today using GIS? University of Oregon students re-created the scenario using ArcGIS Online and social media. Read the article. Round-trip directions and a new Map Tour template, for starters. Read the blog. Learn how to take geodesign from science to practice during Geodesign Summit Europe, September 19–20, 2013, in the Netherlands. Register today and submit a paper. A picture of where people go for Medicare services emerges using the Medicare Mapper for the iPad, developed by Critigen; Social & Scientific Systems, Inc.; and Esri. Find a game plan at the Esri Business Summit for performing better business analytics. The secret? Location, location, location. This Esri public information map shows where the fertilizer plant explosion occurred in West, Texas, and maps the social media posts in the aftermath of the blast and fire. The International Trachoma Initiative uses Esri technology to assess the areas where there's a prevalence of trachoma, a disease that causes debilitating eye infections and sometimes blindness. Read the article. Maps of icebergs. Maps of tax revenue. Maps of earthquake intensity. 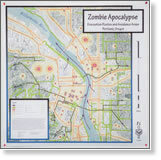 Even maps of evacuation routes for the zombie apocalypse. See maps like that in the Map Gallery at the Esri International User Conference (Esri UC). Submit your map by May 31, 2013. See how an Esri story map morphed into a "story atlas." More than 30 colorful maps illustrate many facts and facets of Mexico including population density, caves and cenotes, and Spanish missions and monasteries. Read more and explore! Read this tip to learn an easy way to add Stamen and MapBox tile sets into your ArcGIS Online web maps. Use Python to update ArcGIS Online hosted feature services. Read the tip. Find out how to use Python to build live data feeds. Watch the demonstration. Enter an app in the User Software Applications Fair at the Esri UC. Deadline: June 21, 2013. Watch this technical demonstration of how to author and publish geoprocessing tools. Demonstrate your app or present an interesting concept at a Dev Meet Up near you. Filter, perform analysis, and build a web map app using ArcGIS Online. Read this tip. Esri introduces ArcGIS for Developers, a site that gives you the resources you need to get started bringing geo into your apps. Read the article. Tune in to Esri's live training seminar Real-Time GIS with ArcGIS GeoEvent Processor for Server on May 23, 2013. Watch Smartphone GIS: Capturing Data with Collector for ArcGIS on May 30, 2013, and learn the advantages of using a new Esri app to collect and edit data in the field. These training options will help you get started creating 3D models of urban landscapes using Esri CityEngine. In this podcast, Roberta Quigley talks about the value GIS brings to many different aspects of the US Forest Service (USFS) mission. Download this new version of Esri Maps for Office, powered by ArcGIS Online. Watch this video series to prepare to teach using the Esri story maps. Amber Case and Aaron Parecki from Esri introduce mobile location-aware apps and the technology to build them. Watch the video. 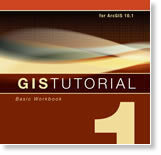 GIS Tutorial 1: Basic Workbook provides a foundation to teach and study basic GIS tools and analysis functions. This new edition is compatible with and offers access to ArcGIS 10.1 for Desktop Advanced software for 180 days. Buy the book. Esri offers preinstalled ArcGIS for Server with Cutting Edge Servers and an optional database server preloaded with Microsoft SQL or PostgreSQL. They are available on Windows and Linux.